One of the things I didn't expect at all when R and I had a child was how hands-on he was. He wanted to be involved in every aspect of caring for Claud. I truly felt blessed having him for a husband and a father to my child. That is why Father's Day became an important event in our family. Even if Father's day is still week away, I already wanted to celebrate it and give daddy R the best Fathers Day treat this year. What better way than to plan a relaxing day at the spa, his most favorite place! Ever since I've known him, daddy R is never a the type to indulge himself. But he would never ever say no to getting a massage. He would never plan it and always wait for me to ask him to go get one so knew this is exactly what would make him happy! 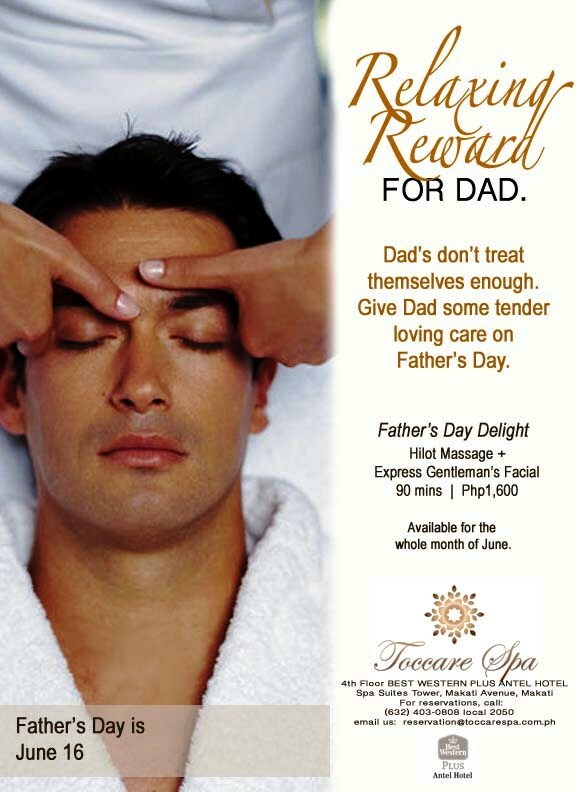 Toccare Spa has a special Father's Day Package aptly named Father's Day Delight. This package includes their famous Hilot Massage and Express Gentleman's Facial using Pevonia products that lasts 90 minutes and cost only Php1900! Naturally, I booked this for R and I and a day of movie and dinner afterwards. Toccare Spa was nice enough to give us a tour of the place when we got there. The ambiance definitely felt calming and tranquil. Their rooms are named with gem stones and their rooms are designed to meet every kind of spa demands. There's a room for barkadas, for couples and even an adjoining rooms. Their facilities are also well kept, clean and complete. There's a dry and wet sauna, a jacuzzi, shower rooms and toilets. It's his day so he should have a mandatory photo with the spa signage. Hehehe! Toccare Spa's couple's room is equipped with its own bathtub, sink and toilet and a lounging area. We enjoyed our green tea here after our massage. Ron loved the area with the Flat Screen TV. He was probably imaging getting a foot massage while watching the NBA finals. Oh men and their favorite NBA team. Go Cavs! I did like the nail spa area though. It looks to be the best place to hold a bridal shower or an intimate party with friends. Because who would want to say no to a foot spa and chika time with the girls? I love that we get to choose the oils for our treatment as well as the scent for the room. We chose peppermint for our body oil and lavender for our room scent. I can't remember the last time I had a traditional Hilot massage, I forgot how good it was for my aching shoulder, back and lower back! I can still feel Ate's hands takign all my lamig away. Every since I became a mom, falling asleep on the massage table was a feat but at Tocarre Spa, I was snoozing immediately! The hubby? Oh, he was snoring a few minutes after Ate started on him! A sure sign that he was in spa heaven and loving it! After an hour, I was watching R enjoy his Express Gentleman's facial. He is still asleep, snoring and obviously getting the rest he truly deserves after sacrificing most of his night time to care for baby Claud while I get some snooze. And when we woke up, he had this huge grin on his face and thanked me. I don't know about you but I think treating your dad with the Father's Day Delight package from Toccare Spa is the best way to make him feel special. Well, that and always loving and caring for him. Find our more about Tocarre Spa through their facebook page.